On August 19, 2011, Ambient DJ had the pleasure of performing at the wedding reception of Stephanie and Sebastian held at the Brooklake Country Club in Florham Park, NJ. Stephanie and Sebastian were introduced to Ambient DJ Service at the wedding reception of their good friends Eric and Ji-May last November. The Brooklake Country Club features beautiful views of a golf course. While setting up, the skies darkened, and a spectacular lightning storm ensued. The power went out momentarily, but then kicked back in with the venue's backup generator. My laptop computer and CD players were acting strangely after the power issue, but fortunately there would be no technical issues this evening. Our DJ package included a two person DJ-MC team, fourteen uplights, and presentation of two video slideshows on a large screen. 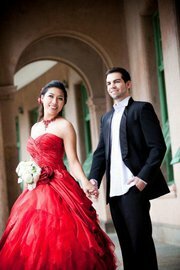 The first slideshow, running on a loop as guests entered the ballroom, was of Stephanie and Sebastian's engagement photo shoot - a grueling nine hour shoot with many wardrobe changes that was held in Taiwan. The second slideshow was set to music and featured childhood photos and images from the couple's travels around the world. Each table was named with a male and female name... such as "Lucy and Ricky" or "Adrienne and Rocky," based off a popular movie or television show. The groom designed a table game played after dinner where tables had about 3 minutes to guess the show for each table name. With the reception filled with brainiacs, there were numerous perfect scores, and a tiebreaker question was asked. Guests at the winning table all took home gift cards. The game was fast-paced, interactive and fun! 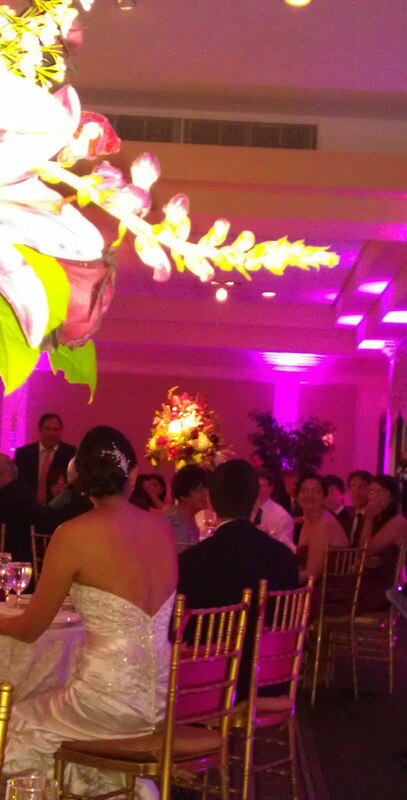 Stephanie and Sebastian have an inner circle of friends who know each other well and have a great time celebrating. They love to dance and party! After clearing the hurdles of the various formalities, the reception transitioned into a high-energy dance club environment. Perhaps one of the greatest compliments to a DJ is when guests opt to continue dancing when the dessert is served. The dance floor action was outstanding and this party is a shoe-in for Ambient DJs' annual list of "Top Ten Parties of the Year"! Thanks Stephanie and Sebastian for entrusting us to perform at your special day!